In biological research fluorescent microscopy is a widespread technique to get dynamic information about living systems. In order to obtain images specimen need to be labeled with fluorescent dyes or fluorescent proteins. During microscope recordings the specimen and their labels are excited with light of a certain wave length (color). In return the labels start to emit light of a different wavelength. The emitted light is usually detected via an optical system and a camera such that an image is recorded. A temporal sequence of images gives rise to data about the dynamics of life. Due to the need of illumination this kind of microscopy is not passively observing only, but actively probing. Traditional specimen illumination is realized through an optical system focusing a cone of light on a point inside the specimen. The focus of the light cone moves sequentially to generate an image point by point. Each time when a light cone penetrates a tissue, the light affects the tissue and it will reacts to the light radiation. Thus inherent to fluorescent microscopy, there is a trade-off between the least possible interference with the tissue and image quality, both opposing dependent on the amount of illumination light. 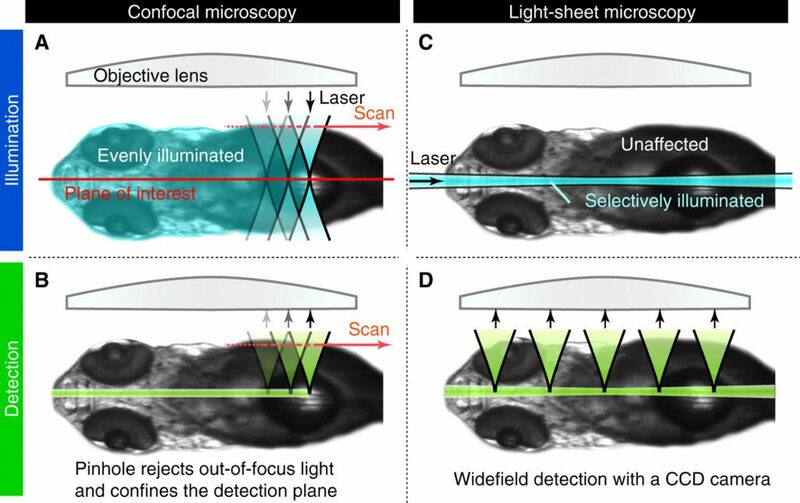 Light-sheet microscopy decreases the amount of illumination light needed for the same image quality by illuminating the specimen with a sheet of light. Due to the reduced photo toxic effects, recording of stacks of images of the entire sample in 3D is possible. Light that enters and passes tissues scatters, making most biological tissues opaque. For example, in the image a fruit fly embryo is embedded in a gel. While the gel is transparent, the embryo is not. Thus, light can pass the gel with minimal scattering but light cannot pass the embryo without massive scattering. In fluorescent microscopy image quality is impeded by scattering of illumination light and by scattering of emitted light. Furthermore, the best images are obtained optically with similar optic properties of all media between sample and magnification lens. 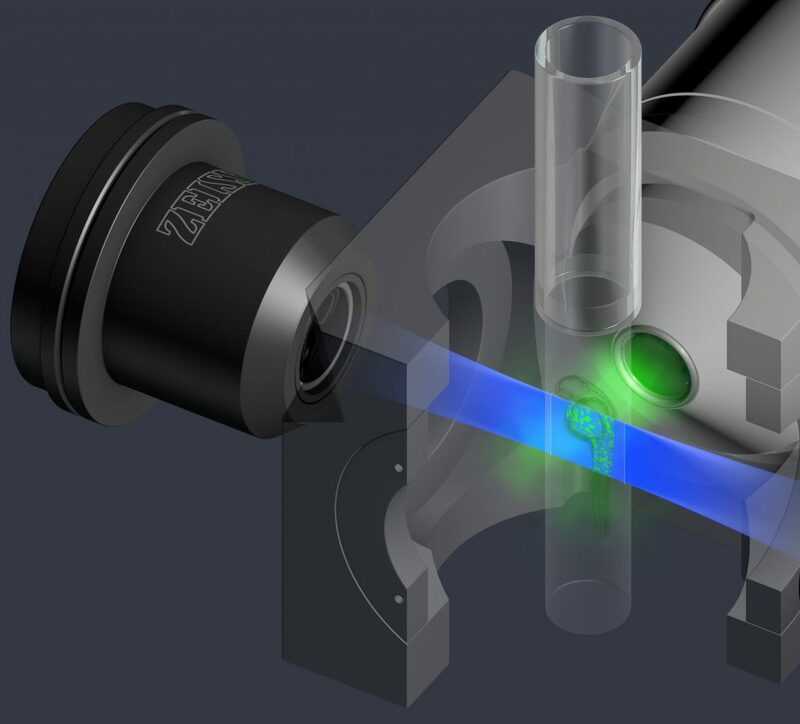 Hence, most light-sheet microscopes allow to fill the space between sample and lenses with water, since the optical properties of cells are closer to those of water than air. Inverted light sheet microscope setup. 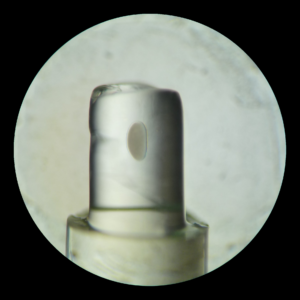 Here the sample is physically separated from the optics to prevent contamination. The 10 times magnifying objective lens is used for illumination, the 100X for light detection. 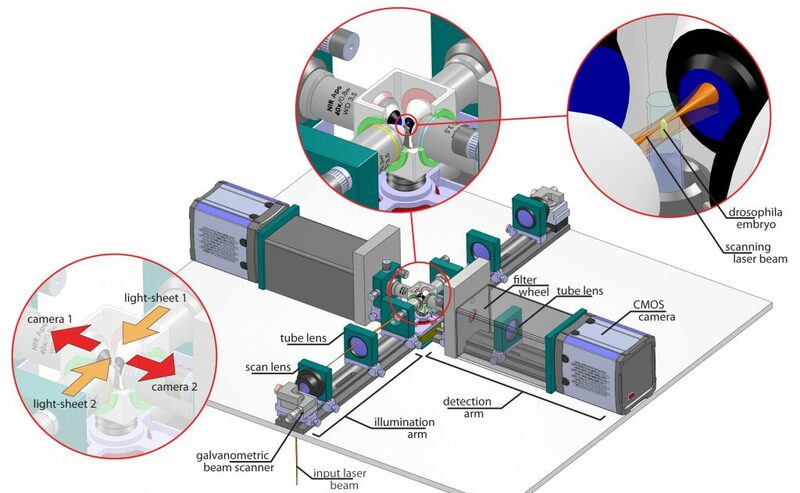 This light-sheet microscope has one optical illumination arm and a perpendicular detection arm coupled to a camera. For best image quality the medium between objective lens and sample is water. However, to prevent contamination of samples through this water, the samples here are physically separated from the surrounding water through a transparent foil held by a sample holder. Setup of our multi-view microscope. It comprises two illumination arms, two cameras and a chamber including a sample holder. Fusion of four views into one final image. Specimen is a fruit fly embryo with labeled cell nuclei. Since most biological specimen are intransparent, one way to get better images, i.e. better data, is to record several images of the sample. Our approach to this end is to use two illumination directions and two cameras. Each snapshot of an embryo is composed of at least 2 images. Due to the gradually changing quality within each image a sophisticated process is needed to computationally fuse these images in a way that the resulting image is of higher overall quality than the obtained images. Our microscope allows us to also rotate our sample such that even more views can be obtained to increase image quality. Cross section of an embryo with labled nuclei for two views. 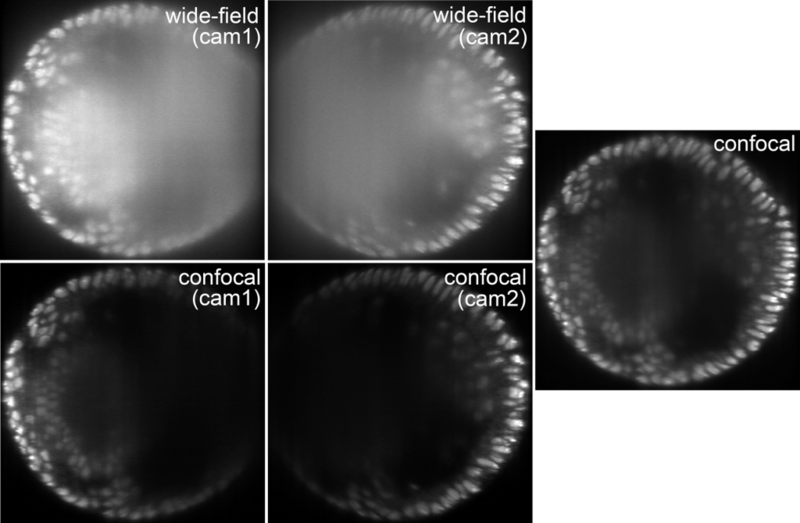 Confocal mode produces better images than wide-field mode and allows for simple fusion. Confocality in microscopy and photography removes scattered light contributions from images, which eventually improves image quality. In multi-view light-sheet microscopy confocality can be implemented through the software that controls the camera chips. 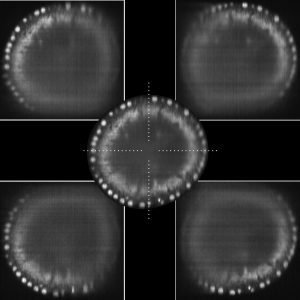 Since in confocal mode image degradation is resulting rather in black than blurry image content, the previously needed sophisticated fusion can be replaced by simply adding the images from different views. In essence, images look better and it is easier to get the final image. 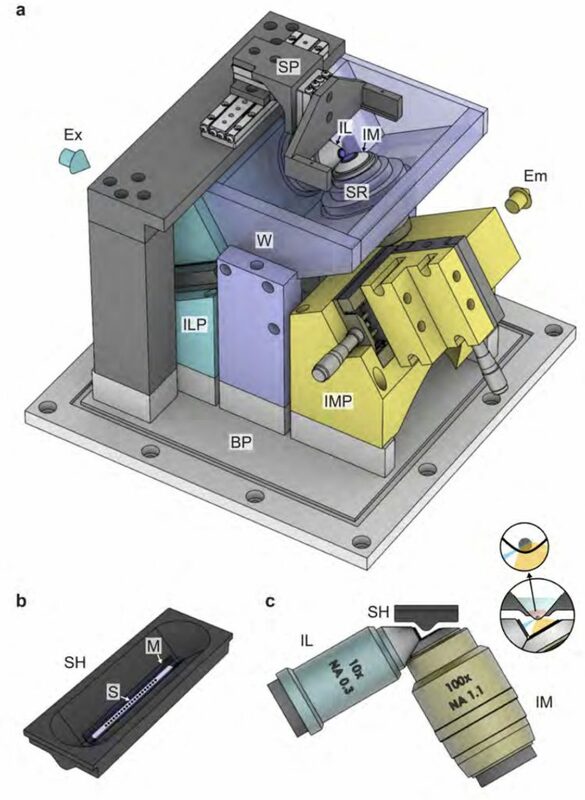 Light-sheet microscopy allows for recording of the dynamics of life of whole (small) organisms in 3D. For example, a movie of the entire embryonic development of a fruit fly embryo can easily build up terabyte of image data. Handling these amounts of (big) data is a (big) challenge. Read more about this topic on Image recognition and Data recognition & processing pages.